A comment on the ‘look’ that Paul Poiret was promoting c 1909 – although perhaps not to Margot Asquith – see ‘Suffrage Stories’ post -‘Madame Mantalini’. ‘HI! MISS! YER TROWSERS IS A-COMING DOWN’ shouts tyke to elegant young woman sporting ‘harem’ trousers. 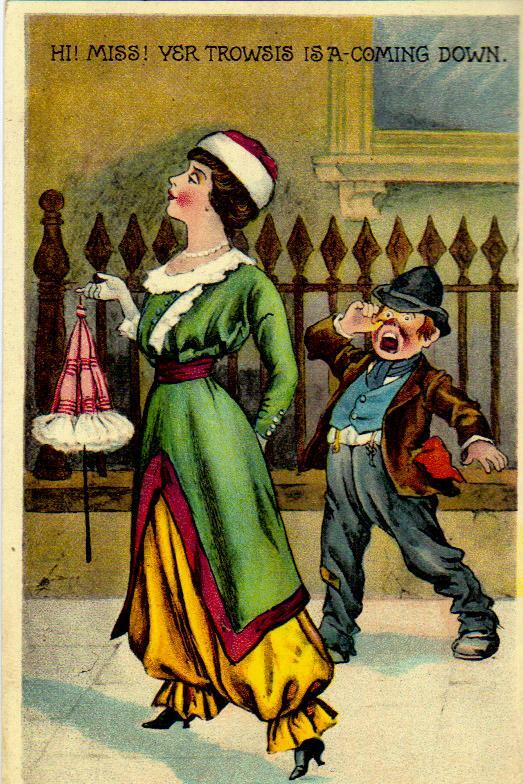 Pre-First World War, published by Felix McGlennon, who having been a rather successful song writer and music publisher, jumped on the bandwagon and added the publication of postcards to his repertoire as the postcard craze swept Edwardian Britian. Not actually ‘suffrage’ but very much of its time. In very good condition – very glossy- £25 post free. This entry was posted on July 30, 2012, 11:19 am and is filed under Collecting Suffrage. You can follow any responses to this entry through RSS 2.0. You can leave a response, or trackback from your own site. Hello! So glad to have stumbled upon this–I love the site. I was also wondering if you could refer me to a book or collection featuring this suffragette-harem-pants piece. I’m currently doing a research project on the use of harem pants in suffrage movements, so I would truly appreciate your help! The ‘haren-pants’ post and picture are not from a book or another site – the words are out of my head and the postcard is for sale (£25 post free – wherever you are in the world!). As I explain on the Home page, I am a bookseller – of long standing – selling books and ephemera – by and about women- as well as a researcher and writer. If you would like to buy the postcard, do get in touch with me directly – using my email that also appears on the Home page. I’m glad you like the site – lots more to come!